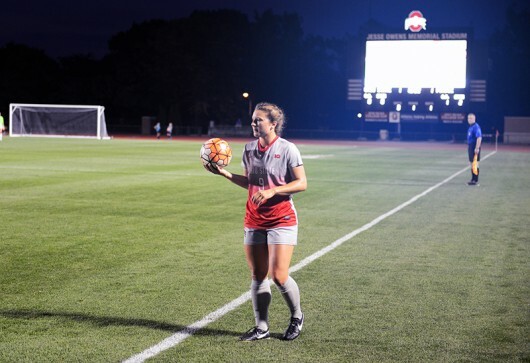 Michela Paradiso is in the midst of her final season on the Ohio State women’s soccer team, but her journey to this point began long before the forward ever stepped onto the pitch for the Buckeyes. Paradiso turned to soccer at a young age and has been in love with the game ever since. Although Paradiso’s love for soccer always existed, choosing where she was to play collegiately was not an easy decision. A native of Columbus suburb Upper Arlington, Paradiso chose to stay close to home. Paradiso sits tied for fifth in OSU history with 16 assists. She’s a star on the soccer field but her hard work does not stop there. Paradiso attributes much of her success on the field and in the classroom to her teammates. “It’s definitely tough, but I have great teammates that support me and understand when I need to study and push me on the soccer field, so it’s great to be a part of a team like ours,” she said. A bevy of mixed emotions might enter student-athletes’ minds when they know it is their final season in college, but Paradiso’s outlook is to remain positive. Paradiso was named OSU’s captain before the season, alongside senior defender Morgan Wolcott, who is currently sidelined due to injury. She said Wolcott is “such a talented player” and that seeing her on the sideline has inspired the team. Being named team captain is an honor that not many athletes can claim, and Paradiso said she is humbled and grateful for the chance to don a “C” on her kit. As an end to the women’s soccer team’s regular season is in sight, Paradiso said she hopes she is remembered for one thing in competing for the Scarlet and Gray: her passion. Paradiso and the rest of the Buckeyes are set to continue conference play on Thursday against Rutgers in Piscataway, New Jersey. The game is scheduled to begin at 7 p.m.